Do you remember the first time you met your in-laws? It was probably one of the most intimidating moments in your relationship. Meeting the parents of your spouse for the first time can be scary, but the relationships you forge with them after your initial meeting are timeless. Now with Christmas upon us, you’re searching for the perfect thing to get them. If they live out of state, it could complicates things because you have to worry about getting your gift to them by Christmas. Luckily, Teleflora has plenty of flower delivery options to choose from. Sending flowers is one of the most traditional ways to show your affection for someone, including your in-laws. Potted plants are a simple and tasteful way to show your appreciation for your in-laws. If you’re searching for something that strays away from the more traditional holiday flowers like poinsettias and carnations, consider sending something like bamboo, orchids or hydrangeas. Potted plants are versatile presents, since your in-laws can place them nearly anywhere in their home, from the bathroom to an end table in the study. A holiday centerpiece is a traditional gift that will be appreciated by anyone, and that includes your in-laws. It can be an even better idea if you and your spouse are making the trek to the in-laws’ house for Christmas. Ask your spouse how big of a table his or her parents have. If it’s a longer table, choose a swag as a centerpiece. Cornucopias might be more appropriate for smaller tables. Regardless of the size, try to feature some holiday flowers and colors in your choice. If Christmas dinner is going to be a more intimate affair with a small number of guests, think about incorporating candles as part of the centerpiece. Sticking with the holiday theme, door wreaths can be festive decorations for your in-laws. Teleflora is proud to bring you plenty of choices in door wreaths appropriate for this time of the year. We have all kinds of color schemes, from traditional green and red to more contemporary gold and white. Whichever you choose, your in-laws will appreciate the timeless gift of a Christmas wreath. 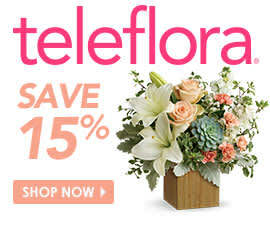 Teleflora also has plenty of alternatives to holiday decor, if that’s what you’re looking for. Think about sending a simple bouquet of flowers to your in-laws this year. Sending flowers is an outstanding way to show people that you care about them. Plus, your in-laws will be able to put fresh flowers anywhere they’d like around their house. If you want something that isn’t holiday-themed, look into our bouquets of roses, lilies and orchids. But that said, if you’re looking for flowers to keep in the holiday spirit, try exploring our selection of carnations, poinsettias, narcissus and holly.